In Murphy’s Breast: Lactation Law and Advocacy in 2014, I discuss four instances in which breastfeeding parents found themselves affected by law and advocacy efforts last year. Many thanks t o Michigan State University’s Center for Ethics and Humanities in the Life Sciences for inviting me to write this piece. Special bonus for Mama’s Got a Plan readers: A fifth section of the post that had to be cut to meet length requirements is included below. More is more! Section 2.5. The Sleeping Breast: We Really Think You Shouldn’t! Public health recommendations have unwittingly discouraged breastfeeding by insisting on separating parents and babies during sleep, based on incomplete and sometimes outright faulty evidence. While maintaining breastfeeding depends on mothers’ ability to feed babies at night, the practice of bedsharing, common throughout the world, is discouraged in the U.S. for fear that sleeping parents will accidentally suffocate their babies. Many public health initiatives focus on procuring safety-rated cribs for newborns. Proponents of bedsharing – and breastfeeding – have long held that while babies should sleep apart under certain conditions, such as having an impaired parent or one who smokes, in most cases infant safety increases when infants sleep in close proximity to their breastfeeding mothers, on an appropriate surface. The supposedly higher rate of Sudden Infant Death Syndrome (SIDS) attributed to bedsharing has been discredited by the presence of co-founding variables. Breastfeeding is believed to be protective against SIDS and, of course, in many other ways beneficial to infant health. Evidence now shows that recommendations for separate infant sleep have actually harmed infant health. 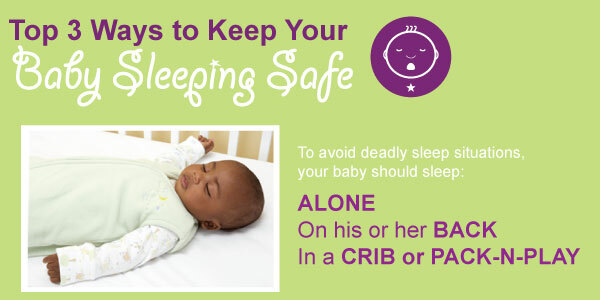 Parents who try to heed warnings to avoid bedsharing are more likely to fall asleep on couches or padded chairs with their infants; those surfaces are dangerous to infants, because babies may become trapped between their parents and padded crevices of the furniture. How curious then that policy makers continue to emphasize “Safe Sleep” policies that equate deterrence from bedsharing with increased infant safety. Michigan went so far as to enact legislation that compels hospitals to advise new parents on infant sleep practices. To be fair, the law itself does not include a warning against bedsharing. It delegates the power to issue recommendations to the Michigan Department of Community Health – that persists in its prescription that babies sleep by themselves, on their back, without any items in their cribs. The law, having created additional liability for hospitals that fail to distribute safe sleep materials to their patients, excuses hospitals from such liability if they retain a “signed parent acknowledgment statement” of having received such materials. Categories: maternity care, reproductive justice | Tags: breastfeeding, breastfeeding mothers, infant mortality, infant sleep, maternal mortality, Michigan law, Michigan State University, reproductive justice | Permalink.